All of us who run regularly know that injury is part of the game. I took to running seriously about 3 years back and since then I have always had some squeaks and pains on a regular basis. Not that they appeared 'out of nowhere' only after I started running, but regular running seems to have accentuated the pain aspect a little bit. 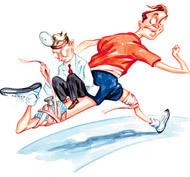 When injured (talking running related here..), one common advice we get is to rest and rest in abundance to give sufficient for the injury to heal. But the new research in this area suggests that it is OK to run if the pain / injury is not major. Evaluate yourself. Is there redness or swelling? Does one side look different from the others? If not, continue exercising. Cross-train in a way that exercises around the area, like cycling instead of running for an injured Achilles tendon. Ice the injured area for about 20 minutes after exercising. See a doctor if you have severe pain and are having trouble with your daily activities. Otherwise, you can give it time — up to a month or two — to get better before rushing to see a doctor. Exercise, and if the pain goes away and is not worse after that exercise, it probably is safe to do it. Walk on it; if you can’t do that, you should not run on it. Injury does not have to be related to bones and legs only, it can be to the heart. Best way to avoid aggravating any injury is to know for oneself the body language and continue such activities in moderation while taking all precautionary steps such as consulting appropriate physician for check up and preventative administration of medicine.